Today marks yet another day in our struggle for justice for Indian Muslims. We are grateful to Allah swt as we complete a very important investigation about the gruesome Jharkhand lynching and bring the facts of this case to light. Earlier today, a consortium of citizens group led by IAMC published its fact-finding report on the 2016 Jharkhand lynching case where 2 Muslim cattle traders in the town of Latehar were mercilessly beaten up and hanged to death. 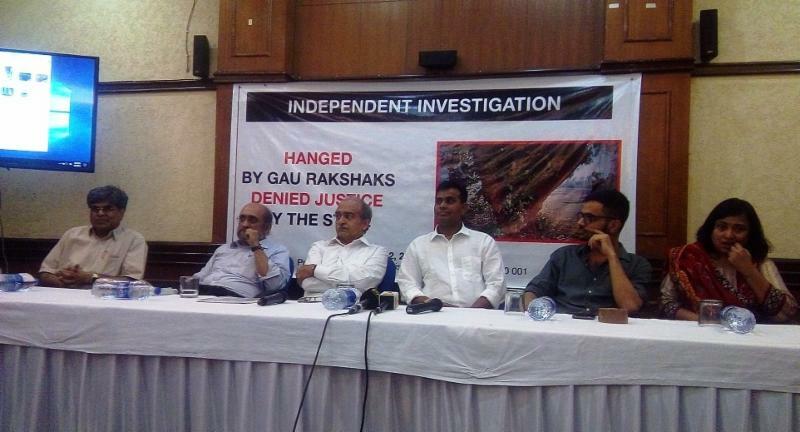 The report was released by a panel of eminent lawyers and human rights activists at a press conference in New Delhi. The panelists spoke out against the alarming nexus between law enforcement and members of the ruling BJP administration to obstruct justice and protect the accused in such cases. In what has now become a predictable pattern, the report uncovers shocking levels of dereliction of duty by the police in properly investigating the murders despite several eye witness accounts and shoddy practices in recording police report and confessions, all of which were seemingly geared towards weakening the case and protecting the accused from prosecution. The report cites Vinod Prajapati, a local BJP leader as one of the perpetrators of the crime according to Mohammed Nizamuddin who was an eye witness and a business partner of one of the victims Mazloom Ansari. In his statement, Nizamuddin said as he reached the spot he found Prajapati standing near the oxen. Upon seeing him, Prajapati shouted to his companions that he (Nizamuddin) was the ‘real cattle trader’ and they should catch him,” the report said. Nizamuddin subsequently escaped on his motorcycle. This is the second fact finding report on the series of lynching cases that have rocked India since the administration of Prime Minister Narendra Modi came to power in May 2014. The first report, released in October 2017, investigated the lynching of Pehlu Khan in Alwar, Rajasthan, and highlighted a similar pattern of cover-up and collusion between law enforcement officials and the members of the ruling BJP to protect the accused from prosecution. Indian American Muslim Council stands committed to advocating for peace and justice for Indian Muslims. We rely upon your financial support to advocate on behalf of Indian Muslims. Please consider making a donation today. An investment in IAMC is an investment towards justice and human rights of Indian Muslims. IAMC is the largest advocacy organization of Indian Muslims in the United States with chapters across the nation. For more information, please visit our website at: https://iamc.com. We are a 501c (3) non-profit organization.